Homeowners should schedule an annual roofing inspection to catch any issues early on and keep the roof in top condition. However, damage can still occur throughout the rest of the year and require emergency repair. The roofing contractors at CL Siding & Construction have shared a few of the most common signs that there’s a problem with your roof in Newark, OH. Know what these signs are so that you can avoid leaks and other roof complications. A failing gutter system or a poorly ventilated and humid attic will cause water damage on the siding near the roofline. This water damage causes paint to blister and peel off and may leave dark water stains on siding materials. If the damage is bad enough, the siding may become soft to the touch. Even one damaged point in the roof that could lead to a leak. Dark spots seen from the ground could indicate a missing shingle or wet shingles that have algae growing on them. The edges of the shingles can begin to curl or buckle or develop cracks when they need replacing. As they get old, they’ll start to shed granules of their material, which you may find in your gutters as you clean them out. It’s easiest to see a sagging roof deck from inside the attic. Look at the decking or rafters to see if they are sagging downward. This usually occurs when they have been damaged by a leaking roof, an overly humid attic, or a combination of the two. If you see any of these signs or anything else that concerns you, it’s best to have the roof repaired before disaster strikes. 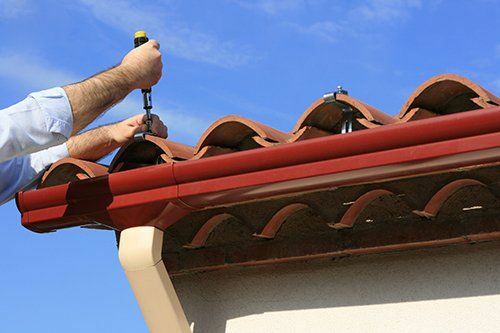 The roofing contractors at CL Siding & Construction have served businesses and homeowners in the area for more than 20 years. Contact them at (740) 323-1406 to request a free estimate or to schedule their trusted service.